From the eastern edge of Europe to the western reaches of the Pacific, and from North America to South Asia, few places were out of reach for the US Air Force during 2017. Ongoing mission demands around the world for the last two decades has saddled the force with a high operational tempo, straining its airmen on the ground and taxing its undermanned pilot corps. But they always rise to the occasion. Tech. Sgt. Jason Caswell prepares to lift weights at Bagram Airfield, Afghanistan on January 4. Senior Airman Austin Boyd, of the 138th Fighter Wing, attaches a hose containing liquid oxygen to an F-16 Fighting Falcon on February 1. Pararescuemen from the 82nd Expeditionary Rescue Squadron prepare for a night jump from a C-130 Hercules over Grand Bara, Djibouti on March 20. Senior Airman Jacqueline D’urso, a boom operator with the 91st Air Refueling Squadron, prepares to make contact with a C-17 Globemaster III aircraft during a refuel mission over the southeast US on April 4. Airmen from the 41st Helicopter Maintenance Unit push an HH-60G Pave Hawk into a C-17 Globemaster III on May 15 at Moody Air Force Base, Georgia. Staff Sgt. Victoria Dames, a 35th Security Forces Squadron military working-dog handler, carries MWD Elvis during the second annual security forces advanced combat skills assessment at Andersen Air Force Base, Guam on June 6. An F-16 Fighting Falcon from the 16th Weapons Squadron, Nellis Air Force Base, Nevada, takes off over Las Vegas for an Air Force Weapons School training exercise on June 8. 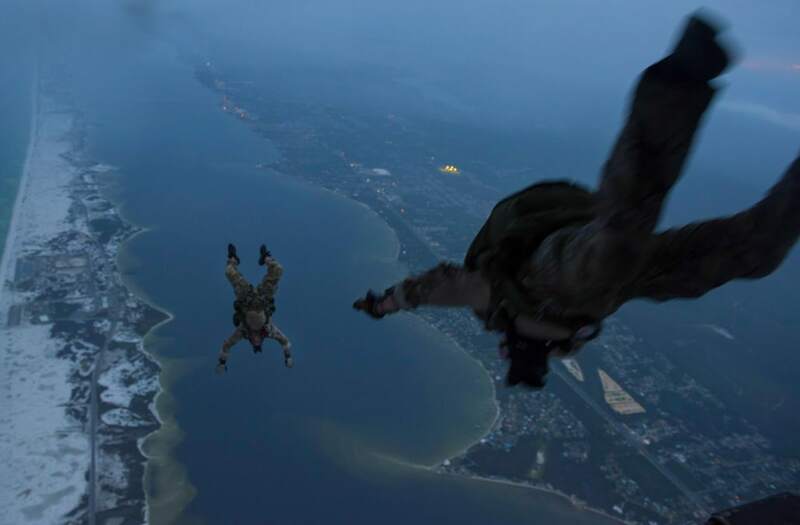 Instructors assigned to the 1st Special Operations Support Squadron, Operational Support Joint Office, jump from a 15th Special Operations Squadron MC-130H Combat Talon II above northwest Florida on June 28. A 340th Aircraft Maintenance Unit maintainer adjusts the window of a KC-135 Stratotanker boom pod before a flight in support of Operation Inherent Resolve, at Al Udeid Air Base, Qatar on July 3. Capt. Michael Slotten, a 61st Fighter Squadron F-35 student pilot, climbs into an F-35 Lighting II at Luke Air Force Base, Arizona on July 7. US personnel from the 75th Expeditionary Airlift Squadron conduct C-130J Super Hercules airlift operations in East Africa on July 19. Joint terminal attack controllers wave at an A-10 Thunderbolt II attack aircraft during a show of force on the Nevada Test and Training Range on July 19. Capts. Wes Sloat, left, and Jared Barkemeger, 7th Airlift Squadron pilots, operate a C-17 Globemaster III during takeoff at Fort Bragg, North Carolina on July 27. Tech. Sgt. Jonathan Carr, a crew chief with the 62nd Aircraft Maintenance Squadron at Joint Base Lewis-McChord in Washington state, checks the engine of a C-17 Globemaster III during Exercise Mobility Guardian at the base on August 6. Combat controllers with the 321st Special Tactics Squadron watch an A-10 Thunderbolt II land on Jägala-Käravete Highway, in Jägala, Estonia on August 10. Airman 1st Class Elizabeth Silvers, left, an 816th Expeditionary Airlift Squadron C-17 Globemaster III loadmaster, and Capt. Travis Delzer, an 816th EAS C-17 pilot, prepare for takeoff before a mission in support of Operation Inherent Resolve on August 23, 2017 Al Udeid Air Base, Qatar. Airmen from the 41st Helicopter Maintenance Unit perform post-flight maintenance on an HH-60G Pave Hawk helicopter at Moody Air Force Base, Georgia on September 3. An air commando from the 7th Special Operations Squadron fires a .50-caliber machine gun aboard a CV-22 Osprey during a flight around southern England on September 11. A crew chief assigned to the 374th Aircraft Maintenance Squadron walks on the flight line near a C-130J Super Hercules during Exercise Beverly Morning 17-06 at Yokota Air Base, Japan on October 26. A 20th Aircraft Maintenance Squadron Airman directs the loading of a bomb onto an F-16 Fighting Falcon at Eglin Air Force Base, Florida on November 2. US Air Force/Samuel King Jr. US Air Force weapons load crew airmen from the 94th and 27th Aircraft Maintenance Units compete in the 3rd Quarter Weapons Load Competition at Joint Base Langley-Eustis, Virginia on November 3. A U-2 Dragon Lady lands on the runway at Al Dhafra Air Base, United Arab Emirates on November 16. Airman 1st Class Jacob Cutler, of the 61st Airlift Squadron, conducts a pre-flight inspection on a C-130J Hercules at Pope Army Airfield, North Carolina on November 28. Airman 1st Class Eric Ruiz-Garcia, 63rd Aircraft Maintenance Unit crew chief, performs an inspection on an F-35A Lightning II at Luke Air Force Base, Arizona on December 1. Santa poses with the crew of an HH-60G Pave Hawk from the 41st Rescue Squadron on the flight line at Moody Air Force Base, Georgia on December 9.